It’s so nice to write on a Friday. Day 17, and I have 20k. I’m behind by about 8k, but I’m still very optimistic. Why? On day 28 last year, I was at 23k. And I still won. On day 23 in 2014, I was at 20k. And I still won. So I’m actually ahead of where I was in ’14 and ’16. Which is good, those years were a bit rough. I’ve got a lot to do this weekend to catch up, but I’m optimistic. I still have a great outline, and am happy with the scenes I’m writing. Just gotta keep on keepin on. I didn’t write much more tonight. I’m hovering at almost 18k. On the one hand, I wanted to keep going, and get to 18k. To at least show some progress. On the other hand, I’m in the middle of a scene. And I think it’ll be really easy to pick up and run with the narrative tomorrow night. Right now it’s almost 11:30pm and I should go to bed. Tomorrow it’ll be early evening on a Friday, and I can write like the dickens. …One Google tangent later: “Dickens is a euphemism, specifically a minced-oath, for the word devil, possibly via devilkins”. Huh. I had no idea. Anyway. I’m pinning my hopes of catching up on the weekend. I have been way farther behind in the past. So I’m still not worried. The long Thanksgiving weekend has always been my safety net. But I’d rather not have to cram everything into that weekend, if I can. We will see how it goes. After blogging every day, I totally forgot yesterday. I didn’t write yesterday, I went to bed early. It happens sometimes. Today…we’re at the halfway point. So I should be at 25k. And I am at…a bit over 17k. Time marches on, and I’m going a bit slow. But the weekend is coming up. Which is a great time to catch waaay up. By Sunday I’ll need to be over 30k. I wrote almost 7k last weekend. So…yeah. 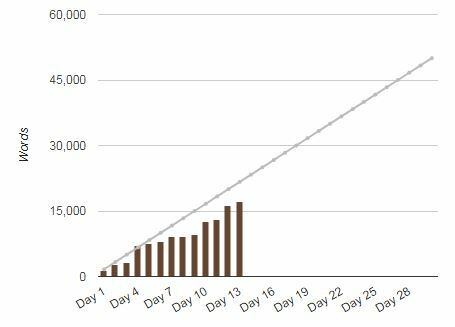 Gotta love NaNoWriMo. While the big birds sharpen their claws. How do you write 50,000 words? One word at a time. Again, not perfect. And not where I should be. I was actually ahead one day! But alas that was short lived. But…I’m still plodding along. Which is what this month is about. Endurance. And being very tired of writing. I wrote 1k earlier today, and another 1k in the evening. I’ve got a lot more to catch up on, and it’s only 8:30. So I’ll be writing more soon. Still lots (lots) of work to do. But for now, word count is king. What do we want? To go to bed early. When do we want it? zzzzzz. Still going strong. Still liking my writing. I read some of my ’06 and then some of my ’11 novels last night. Wow. They’re bad. I really have gotten better. Not that this novel is great. It’s just not…terrible. So, yknow, baby steps. I’m behind by about 4k now I think. But honestly, again, I’m keeping up so I’m happy. I’ve been in way worse shape in past years. Really, I’m right now ahead of where I was midmonth (or later) last year and in ’14. So I’m happy. I feel like I am blogging about the same themes every night. Oh well 🙂 At least I’m blogging.